The jeweler's Crack the Code promotion offers in-store visitors a chance to take home $25,000 -- a welcome bonus for those planning on doing the bulk of their holiday shopping on Black Friday. FREEPORT, Ill., November 9, 2018	(Newswire.com) - This Black Friday, Frank Jewelers is hosting an irresistible promotion for their customers, with one lucky shopper taking home $25,000 in cash. 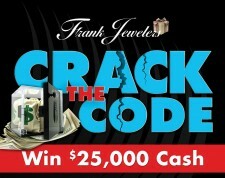 The Crack the Code promotion, which begins on Nov. 23 and ends Dec. 13 (or whenever a guest takes home the grand prize), invites visitors to try their luck in opening up a safe at the jewelry retailer. This safe holds the $25,000 cash prize for the lucky winner of the promotion. The objective is to guess the right five-digit code on the safe -- the first person to guess correctly wins. However, there is one caveat for this almost-too-good-to-be-true contest: The Crack the Code event is only open to in-store visitors to Frank Jewelers. To learn more about the Crack the Code promotion and the other special offers Frank Jewelers is offering during Black Friday, contact their showroom by calling (815) 235-3169 or emailing contactus@frankjewelers.com. Located in Freeport, Illinois, Frank Jewelers is a retailer of an assortment of fine jewelry, bridal jewelry, timepieces and loose diamonds. Family-owned and operated, Frank Jewelers is a proud supporter of their Freeport community and the proud sponsor of organizations like the Freeport Catholic School System, Freeport School District 145, VOICES Domestic Violence, the United Way, and many more. In addition, Frank Jewelers offers a selection of services including on-site jewelry repair, timepiece repair, as well as custom jewelry design services. For more information on the promotions, events, sales or services available at Frank Jewelers, please call 815.235.3169, visit their website at FrankJewelers.com or come into their state-of-the-art Freeport, Illinois, showroom today. Located in Freeport, Illinois, Frank Jewelers is a retailer of an assortment of fine jewelry, bridal jewelry, timepieces, and loose diamonds.